This Awesome Drum Set Is Made With Repurposed Wine Barrels! This Awesome Drum Set Is Made from Repurposed Wine Barrels! 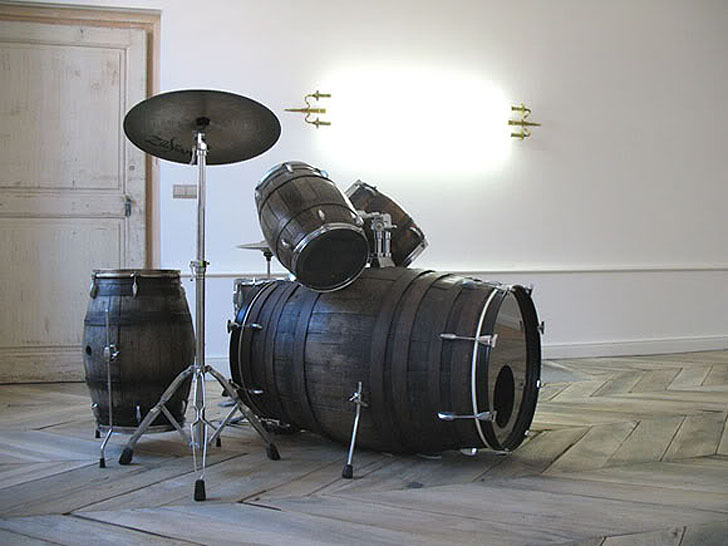 If you’re a drummer and a green enthusiast, you’ll love this awesome drum set that’s been built from repurposed wine barrels. With a complete kit that comes with a bass drum, toms, a snare, and a high hat and cymbal — courtesy of what appears to be Zildjian — you can impress your friends and family not only with your musical prowess, but your fine taste in eco-design. We’ll raise our recycled glasses to that! But what does it SOUND like? No video? I would have thought that would be the first thing people would ask lol. Did anyone else look at this and think "Man, I miss Donkey Konga"
If you're a drummer and a green enthusiast, you'll love this awesome drum set that's been built from repurposed wine barrels. With a complete kit that comes with a bass drum, toms, a snare, and a high hat and cymbal -- courtesy of what appears to be Zildjian -- you can impress your friends and family not only with your musical prowess, but your fine taste in eco-design. We'll raise our recycled glasses to that!